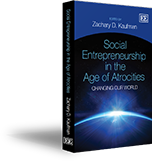 In his book Social Entrepreneurship in the Age of Atrocities, Zachary Kaufman provides numerous examples of how the empathetic leadership of social entrepreneurs provides a foundation for peace as an alternative to strife and conflict. These organizations demonstrate how entrepreneurship in post-conflict countries captures a sense of destiny that comes with finding hope. For individuals looking to rebuild their lives, provide a secure and stable living for their families, social entrepreneurs approach societal issues in a way that allows for people to gain empowerment through new skills and knowledge. These types of leaders bring social innovation to parts of the globe where societal issues can be complex and forbidding. It takes transformative vision and belief to see a future for a society which has experienced the strife of violent conflict where individuals live in peaceful, secure and thriving communities. Reviews of Social Entrepreneurship in the Age of Atrocities are forthcoming.